Let’s preface by saying that Milos is not your party island, or even a ‘bar-hopping’ kind of island. It’s a piece of essentially untouched Greek heaven that is more geared towards ‘rancho-relaxo‘ than anything else. 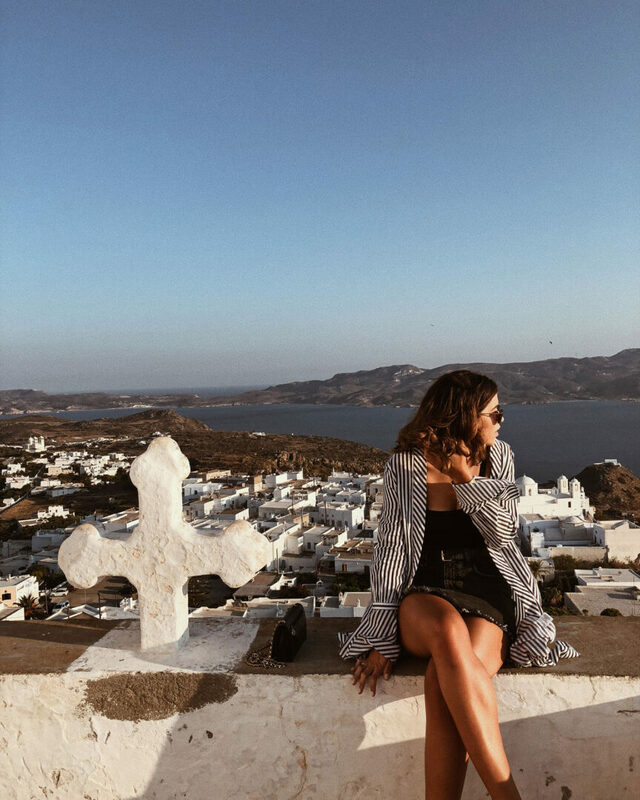 The beaches are a solid 10/10 but the island itself does lack the touristy, fun feel you get from other islands such as Paros (as we mentioned in our Greece Guide: Top Things to do in Paros) and Santorini. But hey, it’s definitely an up-and-coming island and can almost guarantee that in a couple of years time it’ll be where Paros is now in terms of little shops and things to do! 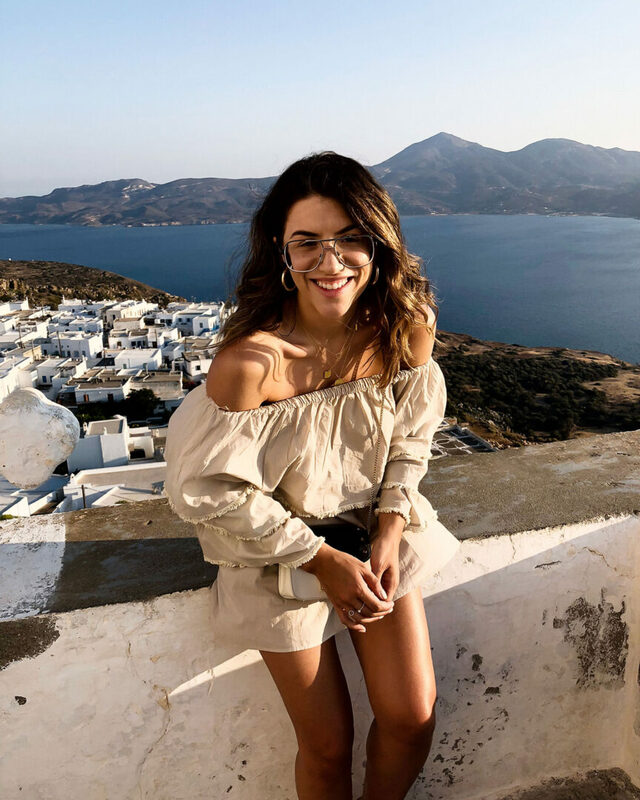 In saying that, how we wish we could combine Paros and Milos together to create a super island of the perfect amount of things to do and ‘fun’ as well as some ridiculously amazing, out-of-this-world beaches. 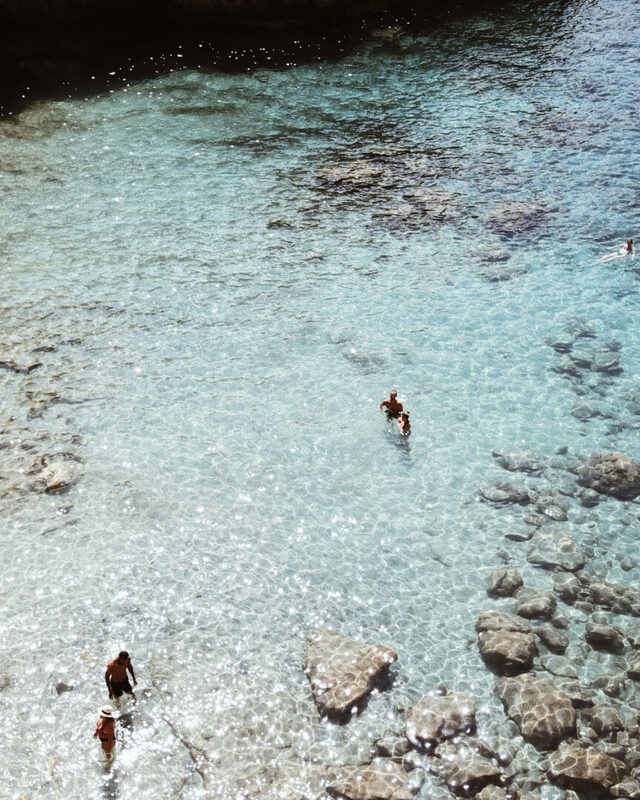 (FYI if you know of a Greek island that is like this, please let us know haha). Milos is also (like Paros) part of the Greek Cyclades Islands and is located just north of Crete, making it the most southwestern island in the Cyclades group. It’s a volcanic island known for its medieval catacombs, ocean caves and ancient pirate landing spots! ONE: Sarakiniko Beach is just the most out-of-this-world, unbelievable beach we have ever been to in our lives. Not because the water was ‘super blue’ or anything like that, but purely because the landscape of the beach looks like something you’d find on a different planet. The waves created from the north winds hitting the coastline cause the almost pearlescent rock to form in to amazing shapes that have often been referred to as ‘Lunar’ or like a ‘Moonscape’. 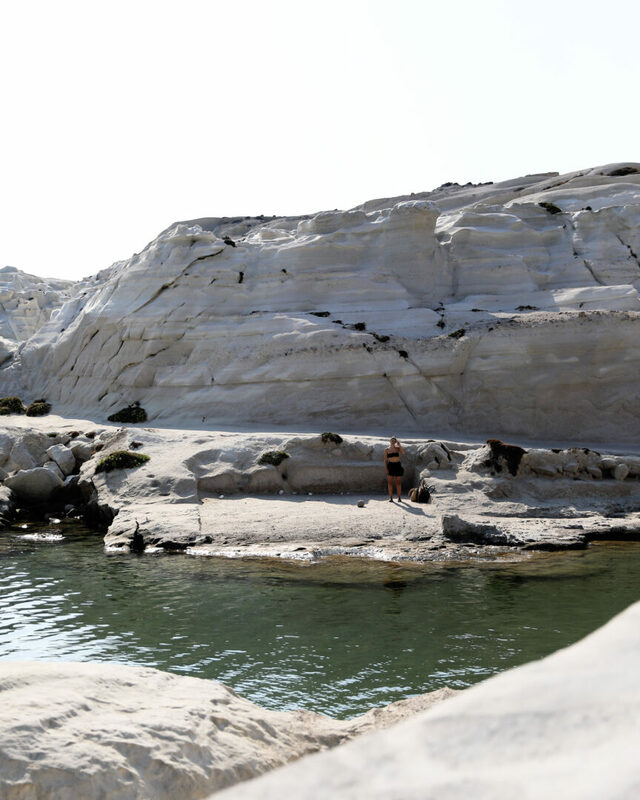 After a quick drive from Adamas, where we were situated in Milos we navigated our way through the alien-like rocks to a beautiful little river/bay/little spring in the middle of the beach. We decided to keep walking around to where the real party was happening on the tip of Sarakiniko and spend most of our time there. Loads of people were jumping off the rocks into the deep, blue ocean – but let’s be honest here, Bec and I were way too chicken to do it, so we slipped into the little rock-pool and made our way out that way. Bec and I have always had a fear of open water and have never liked diving/jumping off anything (even off diving boards as kids into pools – no thanks!) so it was never going to happen, even in Greece! 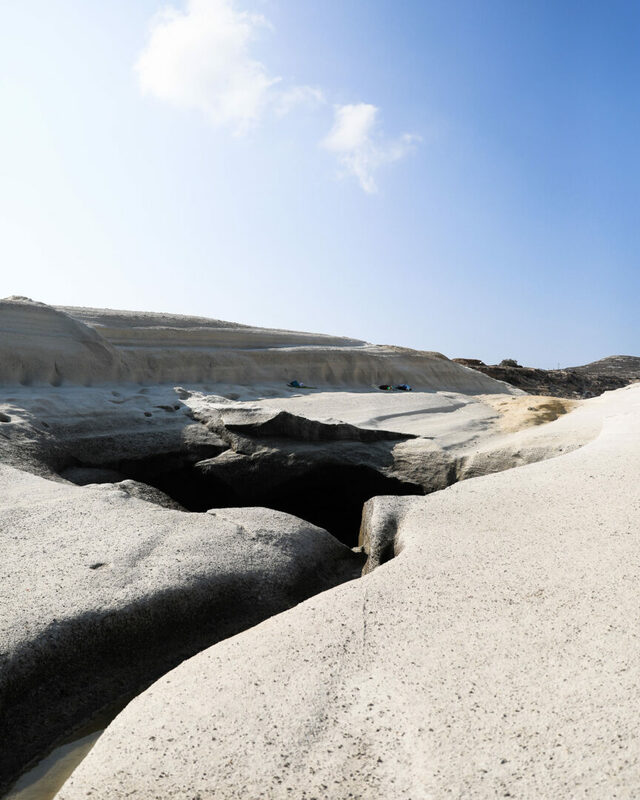 By far the most unique beach we have even seen and an absolute must if you’re travelling to Milos! TWO: Tsigrado Beach is definitely not for the faint-hearted, or for those with any fitness issues/injuries because it was a MISSION and a half to get there. But definitely worth it if you’re up for a little challenge and want to experience a serious slice of Greece beauty. To get to the beach its a really easy, short drive (about 11 minutes) from the main port of Adamas but it’s when you get there at the top of the cliff that the real fun starts. 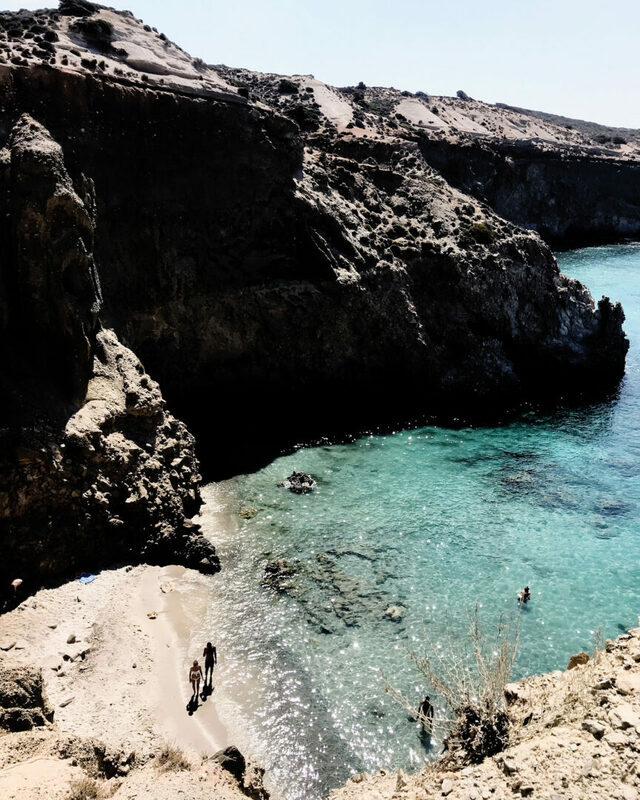 Essentially, to get down to the stunning little beach below you firstly have to abseil down a tiny little cliff (about a couple of metres down) and then carefully walk your way down (another couple of meters) soft, slippery sand to your next challenge, a ladder! The ladder is also literally vertical, but definitely the easiest part of the whole thing. In saying this, it took Bec and I about 5 minutes to get down so it definitely sounds and looks more scary than it really is. We were able to watch a group of people go down before us, so it gave us a good idea of what to do and where to position our feet! It’s an absolute must to get to Tsigrado beach before 10am so that you can walk down at your own pace and not having everyone breathing down your neck, as well as know that it’s not a beach you’ll be able to stay all day at. We were only there for an hour and a half and it took us about 20 minutes to get an opportunity to climb back up as there were so many more people (like hoards) trying to climb down. It’s also a pretty small beach, but perfect if you get there early so you can really take it all in and swim in the stunningly clear water. *TIP* bring snorkels if you can because there are so many fish! We didn’t get to buy any before had and was totally devastated because the fishies looked so pretty! *DOUBLE TIP* It’s easier to walk down the cliff wearing no shoes, so maybe bring a backpack with you so all your beach stuff is out of the way and not over one shoulder like we did. 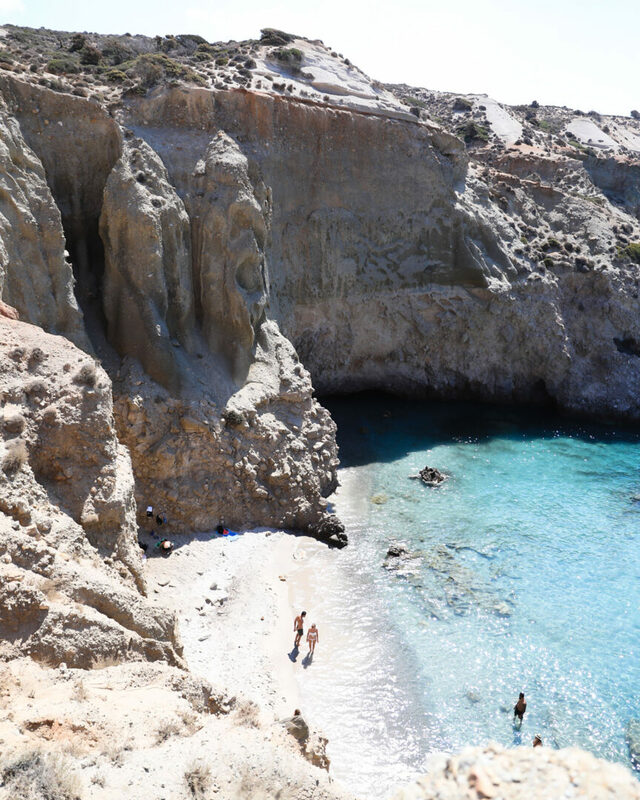 If we ever go back to Milos, we’re definitely going to go back to Tsigrado beach! An absolute stunner. THREE: Plaka Sunset & walking up the stairs to Panayia Thalassitra church is definitely a must for an evening in Milos. Plaka is another main town in Milos and it’s got the most going for it in terms of things to do with a few scattered shops and boutiques in the narrow streets alongside traditional tavernas and restaurants. From the main Plaka square we suggest walking up (a lot) of stairs to Panayia Thalassitra church at the top of the hill on the way to the Milos castle. We could have kept walking up to the castle but honestly were freaking pooped from how many stairs we had already climbed (in our lovely leather sandals) and couldn’t be bothered continuing. 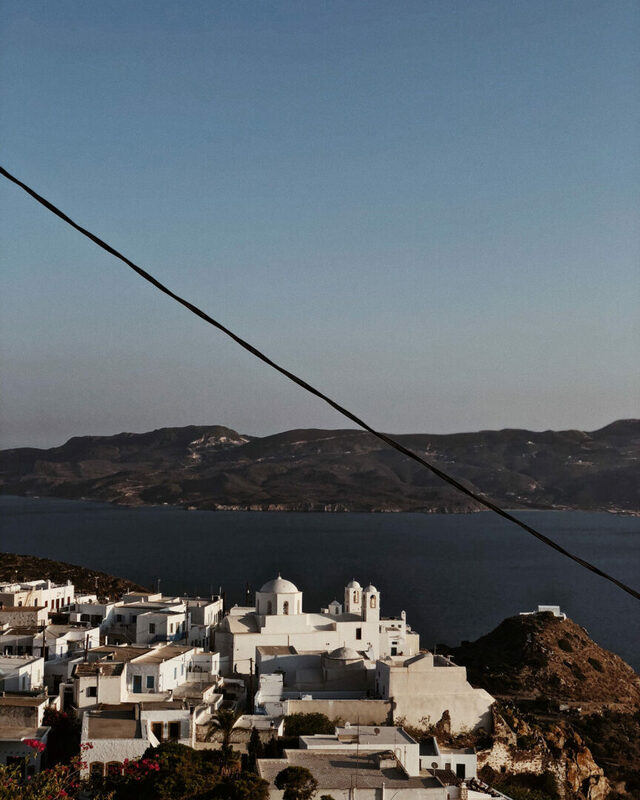 In saying that, the views from the church were so beautiful as it overlooked all of Plaka and the towns of Milos and onto the ocean. We also headed into Plaka town and ate at Archontoula Restaurant and it was super yummy, so would definitely recommend. 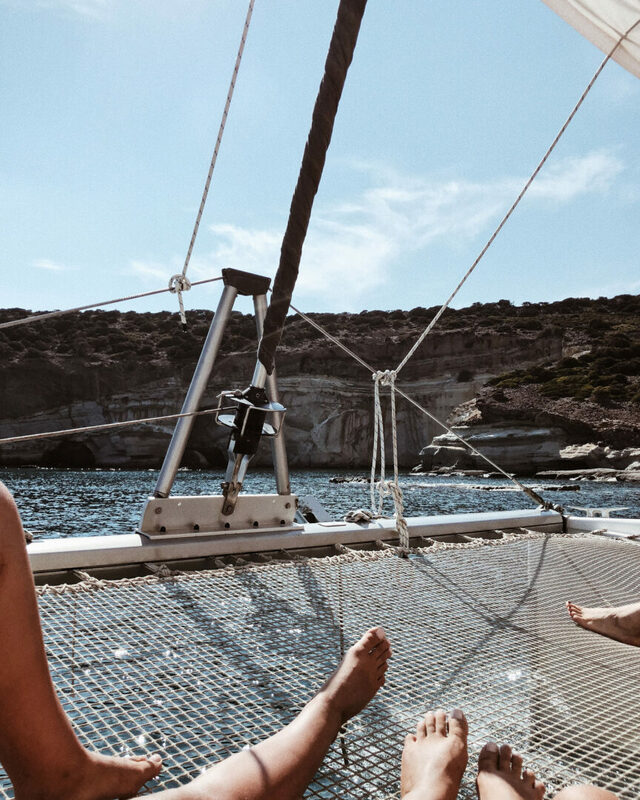 FOUR: Our TOP thing to do in Milos (saving the best til last) was going on a catamaran tour with Milos Adventure Sailing. It was by far the best thing we did (not only in Milos), but on our whole Greece trip and we’d recommend to every-single-person travelling to Milos. 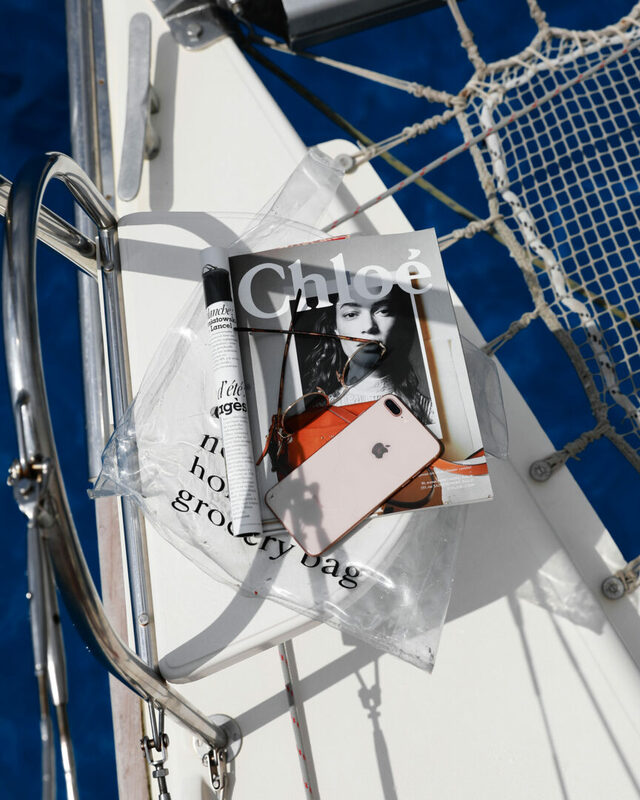 We chose the 11hr all-day island tour of Milos with Milos Adventure Sailing because, although more expensive, was better bang-for-your-buck in our opinion. Our tickets were around €130 each and was ‘Route 2’ in their three route options. It took us west around the island, making 5 spots to jump in the ocean, swim and chill out! We had unlimited drinks (incl. alcohol if you are so inclined), coffee and freshly cooked Greek-style cuisine cooked up by our captains. The only thing we needed to bring were our bathers, a towel, sunnies, hat and sunscreen. Everything else was provided for. Not only was the tour visually spectacular, we learnt so much about the island from our captains as well as really getting to bond with the other tourists on the boat. Our catamaran had a max capacity of 22 people which was perfect as we saw so many other boats on our route which were crammed with people like little sarthelles (i.e sardines) and it just looked uncomfortable. The route took us to areas only accessible by boat and we stopped at (in order) Glaronisa for a quick dip, then sailed to Poliegos island which is uninhabited and has the clearest water ever! Next stop was a mineral spring beach called Firilingos which was actually surprisingly warmer than we expected and then we stopped at Gerakas beach which was so beautiful! Unfortunately the beach has been halved recently due to a landslide, but what is left is still stunning. The water was crystal clear (a running theme will all Greek beaches), and really deep until you get to the pebble shore. Our last stop before returning to Adamas was Kleftiko, which aside from Sarakiniko beach is probably the most well-known beach/area of Milos. Pirate alcoves where many have said pirates hid their bounty after stealing from the mainland or nearby islands, crystal clear (again – lol) water and beautiful coral sections to snorkel and explore made Kleftiko a real highlight of the tour. We spend over a hour at Kleftiko, stopping after our swim to eat our freshly cooked food and chill out before setting sail again. 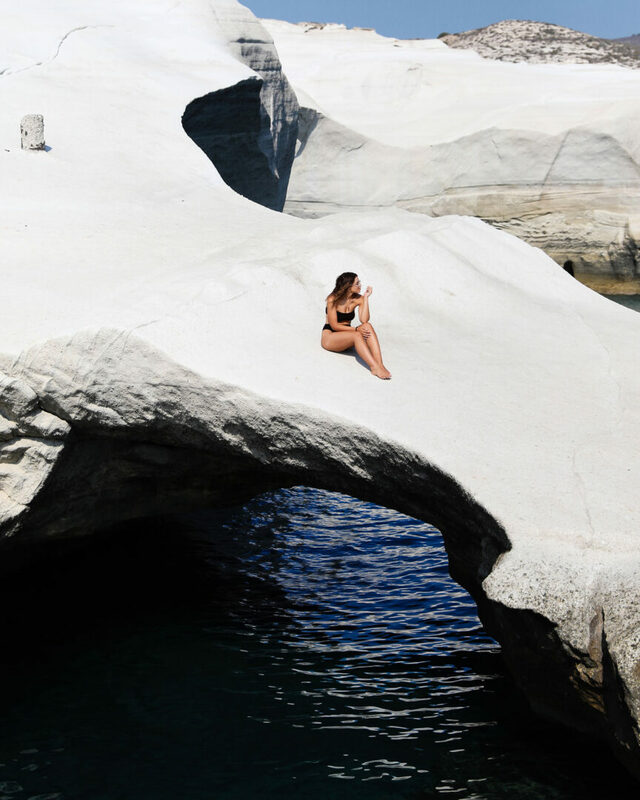 Have you been to Milos yet? What did you get up to?